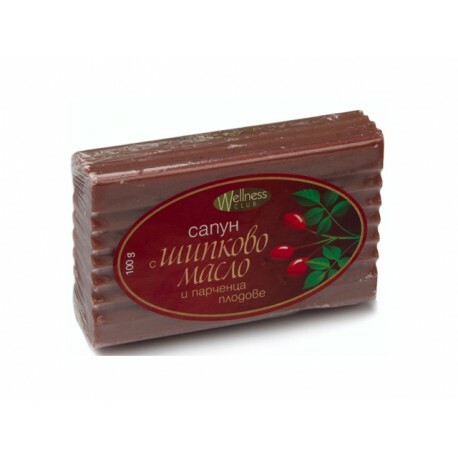 Soap with Rosehip oil and pieces of fruit nourishes and accelerates the recovery process of the skin. Rosehip oil is extracted by the seeds of the Rosehip. The first scientific evidences for the wholesomeness of this oil are found in the 80-ties of the last century. Through the years many test are made with people with – acne scars, deep wrinkles, damaged skin by UV, surgical scars, prematurely aged skin, dermatitis and others. It was found that the Rosehip oil is regenerates the skin, smooths the wrinkles and scars, decreases the aging processes, helps the skin to return its natural skin colour and tonus. Rosehip oil is the only vegetable oil that contents natural retinoic acid (Vitamin A); Vitamin C and Vitamin E; natural fats such as - palmitic acid, stearic acid, oleic acid, linolenic acid (Omega 3), linoleic acid (Omega 6); antioxidants such as - flavonoids, beta carotene. Retinoic acid (Vitamin A): this acid helps in the treatment of acne scars and dermatitis, sun burnings, thin wrinkles, wounds scars, stretch marks and pigmentation. Natural Vitamin A slows the aging processes, help the regeneration of the skin by stimulating the producing of collagen and elastin in the derma. Linonelic acid (Omega 3): this acid softens and moisturizes the skin and it is extremely important for the cellular membrane structure. Helps with eczema by suppressing the processes leading to overproduction of sebum through regulating the formation of androgens (hormones, which affect the production of sebum). Linoleic acid (Omega 6): This acid helps the natural protection of the cells against the environment and it is determinating for the cellular membrane structure. Most Omega 6 acids have anti-inflammatory effect which is necessary for the functioning of immune system. Omega-6 is the basis for the synthesis of gamma-linolenic acid. This amazing ingredient increases the endurance of the cells and moisturizes the fatty layer under the skin. - The skin becomes smooth and firm, healthier and bautiful. Sodium Palm Kernelate, Sodium Palmate, Rosa Canina Fruit Oil, Aqua, Rosa Canina seed powder, Sodium Chloride, Parfum, Glycerine, Tetrasodium EDTA, Tetrasodium Etidronate (HEDP).